If you have any questions or want to enquire about dates, use our form to contact Sophia Boursot or see their website for more information. Wine buffs and food lovers could not be better placed for visits to Pommard, Volnay, Mersault and Beaune. One of the pleasures of living two steps from the home of a wine merchant is that tastings and tours can be personally arranged; and there’s not a lot Guy Boursot doesn’t know about Burgundy wines. 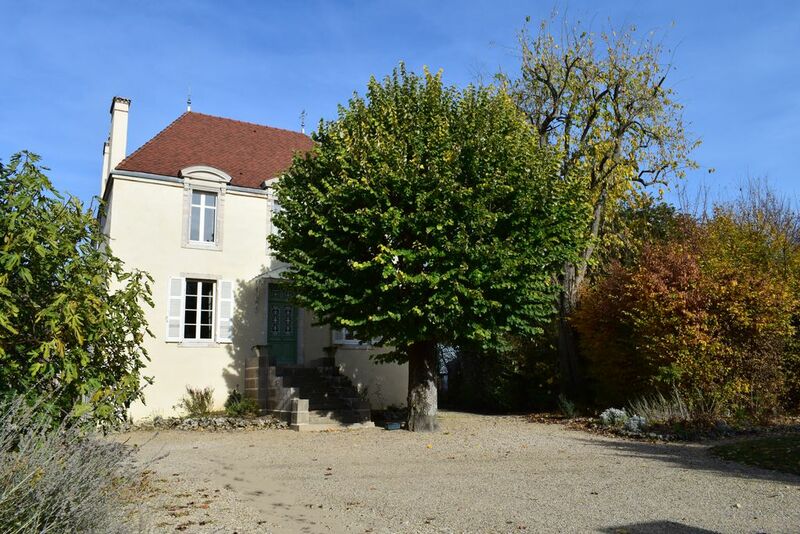 As for the gite, it’s an immaculate two-storey vigneron’s house standing in a vast garden in a quiet, friendly corner of the village. The odd train passes by but the birdsong is louder – trees and barns are great mufflers! Enter the porch marquise to find big airy rooms with their 1850s’ features intact, windows, doors and tommettes all gleaming and well cared-for. The décor is traditional French yet the comforts are 21st century… soft-carpeted bedrooms with new mattresses and laundered linen, great modern bathrooms, a super kitchen, wifi and satellite TV. Outside: a shady arbour for summery meals, herbs from the garden, eggs from the hens, and a beautiful old fig tree in the gravelled courtyard. Pick figs for breakfast, stroll to the village for croissants and baguettes. Minimum stay: 3 nights. 3 nights on weekdays. 4 nights at weekends. 4 nights in high season. Catered meals available by arrangement. Restaurants 3km. Have you visited L’Ancien Domaine? Be the first to leave a review. The UNESCO listed Beaune and Hospices de Beaune, only a few minutes away, are gems to be visited, with some free concerts in August, light shows on ancient buildings during the summer and other events and of course the famous Ventes in November. Main wine events in calendar are the VENTES in Beaune always on 3rd weekend of November, SAINT VINCENT TOURNANTE in different villages on 3rd weekend in January - 2019 village will be Vezelay. The top wine villages of Pommard, Volnay and Meursault are all our immediate neighbours. The Cote de Nuits villages are from around 15 mins away and are easily accessed. It's not just about wine though - Burgundy chateaux are also renowned. Bligny-les-Beaune centre is about 750 metres away and has a bakery, general store, bar/tabac/poste and pizza van on a Friday night!. Large outdoor naturally cleaned swimming pools are only 3.4 k at Beaune Cote Plage. At the house we have several int. and ext. games to play, such as Yahtzee, backgammon, skittles, pétanque and table tennis. There is also a selection of DVDs and books. 2019 sees the return on the biennial SCULPTURE EXHIBITION at NOLAY that takes over the whole town. Definitely worth a visit. Open from 29 June to 12 July 2019.